I have a history of eschewing social networking sites like Facebook, MySpace and even the long-forgotten Friendster. The platform never really appealed to me, and once I became a teacher it seemed even wiser to avoid public profiles of this nature. 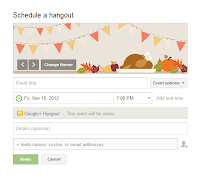 However, Google+ has an amazing feature going for it, a feature that may have very well turned me from a social-networking hater to a true believer. The Hangout. 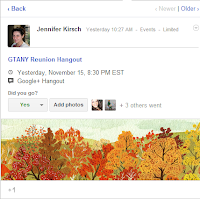 I had my first Google+ Hangout a few weeks before the Google Teacher Academy, and the ease with which I could connect with my teammates from all over the world (indeed, we were hooked up between Singapore and across the US) was instantly appealing. Video conferencing has always seemed difficult to set up and impersonal, wholly unappealing. Even iChat struck me as more trouble than it was worth. 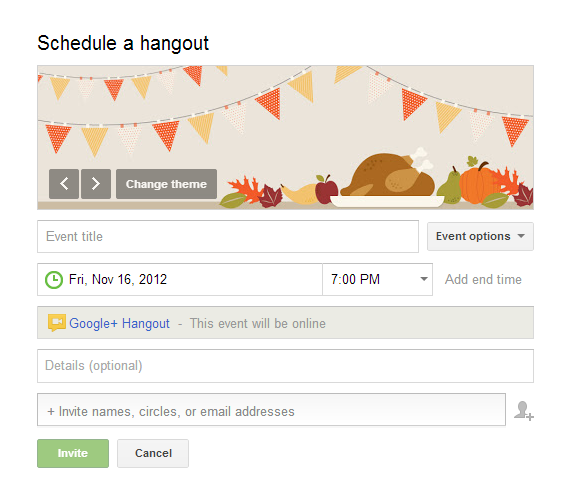 But a Hangout is easy! Literally the click of a button had me sitting at my computer, face to face with Team Goldberg (Go Team!). Last night, after a stream of melancholy, withdrawal themed tweets, a few pals from GTANY and I organized a reunion Hangout. I volunteered to set up the event, and it was as easy as sending a group email (Note to Self: Next time choose the "On Air" option to record the conversation). And oh, the delight I felt when I joined the Hangout and saw Brent (@catlett1), Tanya (@edtechschools), Sean (@remedy1978), BA (@bafish10), Linda (@lindayollis) and JR (@gochemonline) chatting away in real time. 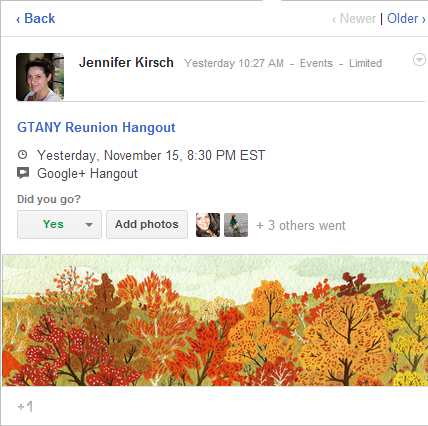 If you had any doubt about the lure of the GTA and Google+ Hangouts, look no further than Fiona (@fibeal) who deserves an MVP award for waking up at 3am to join our conversation from Fish Hoek, South Africa. That is some serious commitment. It was nourishing for both mind and heart to spend even a short time with these lovely folks from around the globe. We chatted about our ideas, our families, our classrooms/schools. We were impressed by Cat's early Christmas tree (lit up on November 15th! ), JR and Linda's virtual classroom collaboration, and, of course, the Google Effects extension that provided us with tiaras, party hats and snorkeling gear.